In this tutorial we will show you how to change your OpenCart store logo and favicon. To achieve this, please login your OpenCart Admin panel using your administrative username and password. From the OpenCart Administrative Dashboard, please access the System>Settings menu from the main navigation on the top. Access the Settings>Image section of the admin panel. 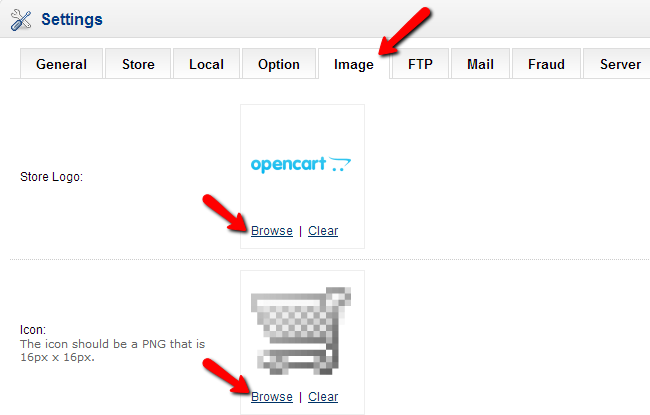 From the Image tab you may change your OpenCart logo and favico by clicking on the Browse button under the default image. In case you would like to just clear the existing image to remove either the favico or the store logo.